Links International Journal of Socialist Renewal hopes to contribute to the left debate on Greece by providing background information, thoughtful comment and presenting positions of various left organisations. Greek Prime Minister Alexis Tsipras during a swearing-in ceremony this month. 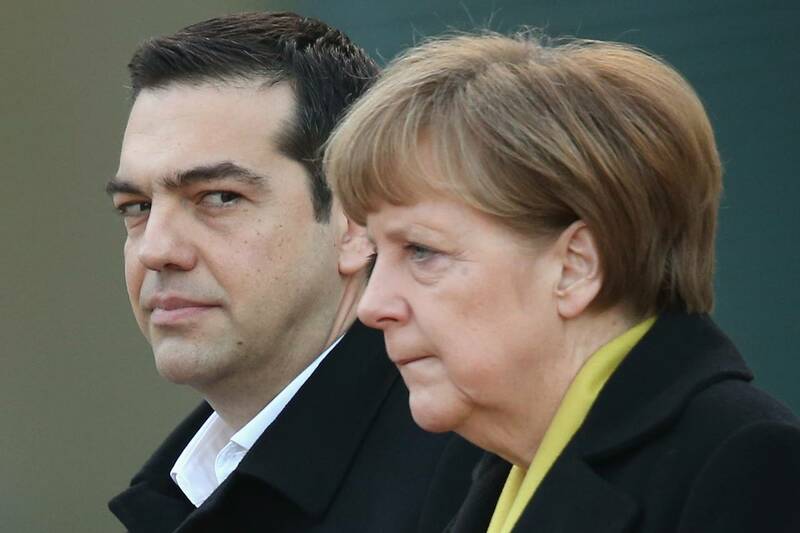 Alkis Konstantinidis/Reuters. A man receiving food from a solidarity network in Attica, Greece. Photo Greece Reporter. July 21, 2015 -- Jacobin, posted at Links International Journal of Socialist Renewal with permission with permission -- Greece continues to be in flux. On July 5, the Greek people went to the polls and voted over 60% against austerity. One week later, the Greek government agreed to a new memorandum in principle after an all-night negotiation that was described at times as “mental water-boarding”. Finally,on July 15, the first pieces of enabling legislation were passed by the Greek parliament with a large rebellion of SYRIZA members of parliament voting against the laws. July 17, 2015 -- Hintadupfing, submitted to Links International Journal of Socialist Renewal by the author -- The promise of a peaceful integration of capitalist equals lies tattered on the floor of a negotiation room in Brussels. There, the SYRIZA-led Greek government finally succumbed to the blackmail, economic carpet-bombing and “mental water-boarding” of the institutions of European capitalism. 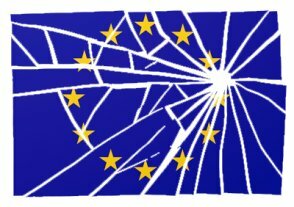 The final weeks of the debt negotiations culminating in a cynical political coup against Greece have laid bare the undemocratic, technocratic nature of the European Union (EU), which operates as a thieves’ kitchen to protect vested financial interests at an incalculable human cost. En momentos como estos, debemos actuar y hablar con sinceridad institucional y coraje político. Debemos asumir la responsabilidad que recae en todos y cada uno de nosotros. Debemos defender, de acuerdo a los dictados de nuestra conciencia, las causas justas y los derechos sagrados, inviolables y no negociables de nuestro pueblo y de nuestra sociedad. Debemos proteger el legado de aquellos que dieron sus vidas y su libertad para que hoy podamos vivir como personas libres. Debemos preservar la herencia de las nuevas generaciones y de las futuras, así como la de la civilización humana. También debemos preservar esos valores irrenunciables que definen y alientan nuestra existencia personal y colectiva. Cómo elige y decide actuar cada persona puede variar y nadie tiene el derecho de trivializar las decisiones que se toman a partir de un juicio personal y existencial, para denigrarlas o explotarlas políticamente. July 16, 2015 -- Socialist Alliance, posted at Links International Journal of Socialist Renewal -- Socialist Alliance condemns the effective imposition of colonial status on Greece by the ruling institutions of the European Union (EU), which represent the interests of the big banks whose speculative excesses contributed in great part to the accumulation of the “Greek debt” they are now seeking to recover. The popular will of the Greek people, expressed in the 61.3% "Oxi" (“No”) vote in the July 5 referendum on the previous European Union austerity demands is being denied and even the decisions of the Greek parliament has been put under EU supervision and control. 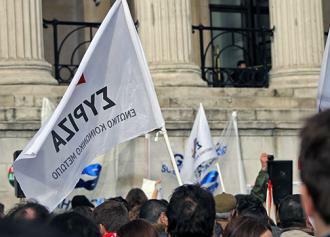 July 15, 2015 -- In a statement issued on Wednesday, July 15, 109 of the 201 members of the Central Committee of SYRIZA took a position against the Greek government and the European creditors, calling it "a new Memorandum, with onerous and humiliating terms". The statement came as Prime Minister Alexis Tsipras was pressuring parliament to meet the ultimatum of the European authorities by passing core components the latest drastic austerity measures by Wednesday. 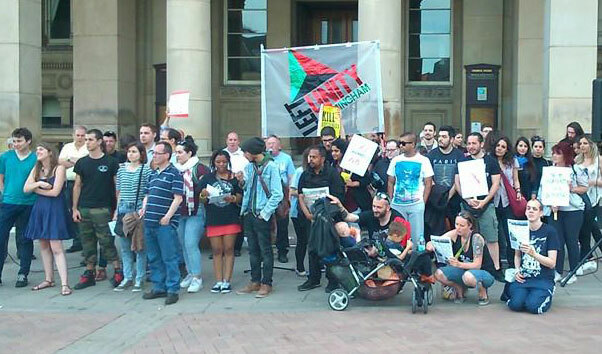 Greece solidarity rally in Birmingham, July 13, 2015. Report HERE. 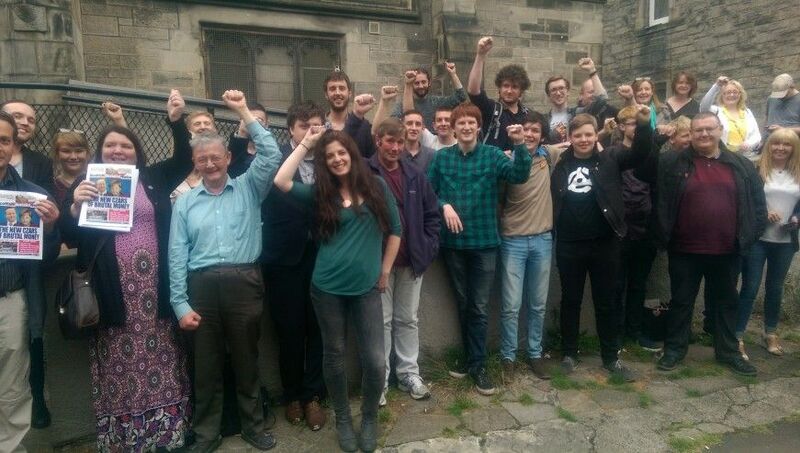 Left Unity (Britain) national secretary Kate Hudson writes. July 15, 2015 -- Left Unity, posted at Links International Journal of Socialist Renewal -- We unreservedly condemn the criminal attacks by the states and institutions of the European Union on Greece and its people. Not satisfied with the imposition of extreme neoliberalism and the destruction of the livelihoods and welfare of millions of people, these so-called European "partners" are now proceeding to strip Greece of its national sovereignty and self-determination. President of the parliament of Greece, Zoe Konstantopoulou. 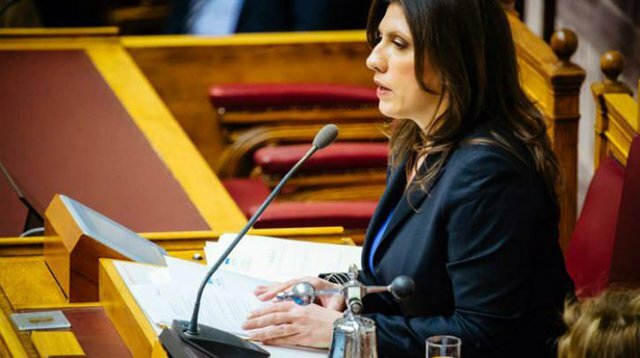 The following speech was delivered early in the morning of July 11, 2015, by Zoe Konstantopoulou, president of the Greek parliament, on the question of the government’s proposal to the creditor institutions. She voted "present", in effect an abstention. Translated by Nicholas Evangelos Levis for Analyze Greece. First published in Greek on left.gr, July 12, 2015. Posted at Links International Journal of Socialist Renewal. July 13, 2015 -- Reports from the Economic Front, posted at Links International Journal of Socialist Renewal -- The Troika are celebrating the end of negotiations with Greece, proclaiming that thanks to their tireless efforts the Eurozone remains whole. And why wouldn’t they celebrate. They have demonstrated their power to crush, at least for now, the Greek effort to end austerity and its associated devastating social consequences. Tragically, SYRIZA has not only surrendered, the nature of its defeat is likely to leave the country worse off, at least both economically and very likely politically as well. Democracy Now!, July 14, 2015 -- Michalis Spourdalakis, professor of political science at Athens University and a founding member of SYRIZA: "The Greek prime minister and the country’s minister of finance were blackmailed by the eurozone people." Read the full transcript HERE. July 13, 2015 -- Keep Talking Greece, posted at Links International Journal of Socialist Renewal -- Twitter hashtag #ThisIsACoup was trending worldwide on Sunday night, July 12, as European leaders were pushing and kicking around and putting pressure on Greece's Prime Minister Alexis Tsipras to either accept their deal or exit the euro club in an unprecedented collective action of EU/EURO-blackmail against a member state. July 13, 2015 -- The Bullet (Socialist Project, Canada), posted at Links International Journal of Socialist Renewal -- As against those on the international left so keen to put the boot in against the SYRIZA government with the charge that they had abjectly "capitulated" already with the plan passed in the Greek parliament, it is instructive to read this document from the German finance ministry. SYRIZA's unique capacity on the international left to build the type of party capable of both mobilising against neoliberalism and entering the state to try to actually do something about this has always hinged on the way it sought to find room for manoeuvre within a European Union that has neoliberalism in its DNA, going back all the way to the Treaty of Rome let alone the Economic and Monetary Union 30 years later. July 12, 2015 -- Socialist Alliance, posted at Links International Journal of Socialist Renewal -- Greece's austerity-and-debt-driven crisis has prompted a humanitarian catastrophe. Pensions, meanwhile, have been cut by 15–44%, with 45% of all pensioners living below the poverty line. Suicide rates have skyrocketed. All very sad, no doubt, but surely you cannot just allow reckless behaviour by the Greek people without any consequences?